31 long and short pin bamboo comb. This comb removes hidden dirt, mats and loose hairs from your dog effortlessly. The rotating teeth gently rotates through the coat without damaging hair. The long teeth reach deep into the pets hair lifting loose hair and the short teeth collect hair released from the upper layers thereby leaving a beautifully clean soft coat. Fine round ends makes it safe on your pet's sensitive skin. HEALTHY GROOMED COAT - Designed for both home and professional use. In fact this dog and cat comb stainless steel 31 pin comb will remove all hidden dirt, mats and loose hair from your pet with ease. The long teeth reach deep into your pet's coat lifting loose hair. The short teeth collect hair released from the upper layers simultaneously. Leaving a beautifully clean soft groomed coat. BREEDS and HAIR TYPE - Suitable for use on breeds with medium to longhaired coats. 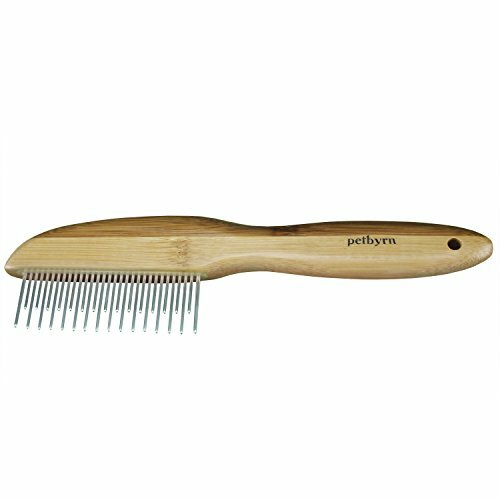 High-quality eco-friendly bamboo and hygienic stainless steel comb. Featuring the dual advantage of two different lengths of teeth to get through the thickest of hair. Perfect for dematting and shedding coats while also preventing future tangling and matting. GENTLE and SAFE - Individual 360-degree rotating teeth gently rotates and glides through your pet's coat without damaging and pulling their hair. The fine smooth round ends make it safe for your pet's sensitive skin. And best of all, ensuring your pet does not get cut or scraped from sharp edges like some inferior combs do.